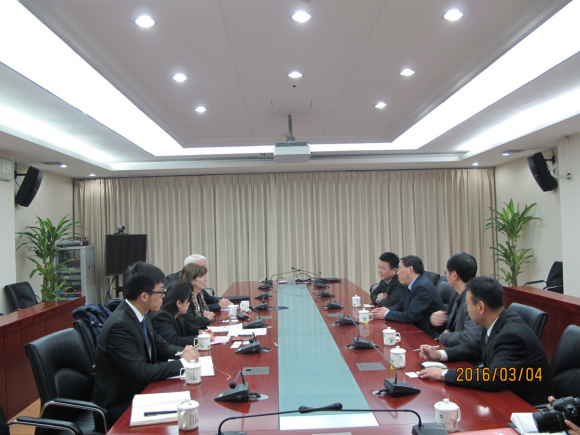 On March 4th, 2016, with the invitation from Australia Education Management Group and its partner university in China, delegation of University of Western Australia led by Deputy Vice Chancellor (Research) Prof. Robyn Anne Owens visited University of Chinese Academy of Sciences. Vice President Prof. WU Yueliang and Director of International Affairs Office Dr. XIE Yong joined in the reception and the meeting. During the meeting, both parties introduced their current situations, as well as their academic progress, towards each other, of which they all spoke highly. The academic staff from both parties also discussed the newly discovered “gravitational wave” and made an attempt to combine this subject with their future collaborations. The two universities also extended their expectations towards the workshop of articulation in April, and exchanged their opinions on the future articulation program of PhD students. This visit has assured the direction of the collaborations between the two universities, and has also built a solid foundation for future cooperation.